Some 400 million years ago, during the Devonian Period, molten lava bubbled up from the sea floor as a result of the movement of massive tectonic plates. The Great Nova Scotia batholith was formed, a large deep seated rock intrusion. 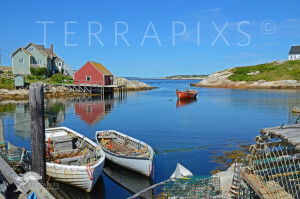 Some 20,000 years ago, the unique landscape of Saint Margaret’s Bay and Peggy’s Cove and surrounding area was carved by glacial migration and powerful ocean tidal forces. Indeed, much of Nova Scotia’s coast line has an extravagant, rugged beauty to it but none more so than Peggy’s Cove. The Labrador Current flows south from the Arctic and cools the ocean during the summer months while the Gulf Stream swings up generally northeast from the Caribbean. The confluence of these currents brings both Arctic and tropical marine species to the area. The rich Atlantic waters supporting this abundant marine/coastal ecosystem in turn supports a vibrant fishing industry. While some people believe the village at Peggy’s Cove, formerly founded in 1811, was likely named after Saint Margaret’s Bay, Peggy being a nickname for Margaret, others of a more romantic nature believe otherwise. Perhaps the most interesting legend claims that the cove was named after a young girl named Peggy who was the sole survivor of a shipwreck at Halibut Rock and who later married a resident of the cove area around 1800. Regardless of where the name “Peggy’s Cove” came from, it is a treasured spot that is visited by many locals and distant travelers alike to soak up the unrivaled scenic beauty of the area. The Peggy’s Cove Commission Act was passed in 1962 specifically to control development in and around the surrounding village. It was in St. Margaret’s Bay that, on September 2, 1998, Swissair Flight 111 crashed with the loss of all on board. One of the two memorials established in memory of the 229 men, women and children who perished that day is located in Peggy’s Cove. There is perhaps no more fitting location for such a memorial eternally enhanced by the natural beauty of the area. It is a place well worth visiting and, while there, do sample the excellent lobster and fish dishes and take time to relax and breath in the sweet salt air.